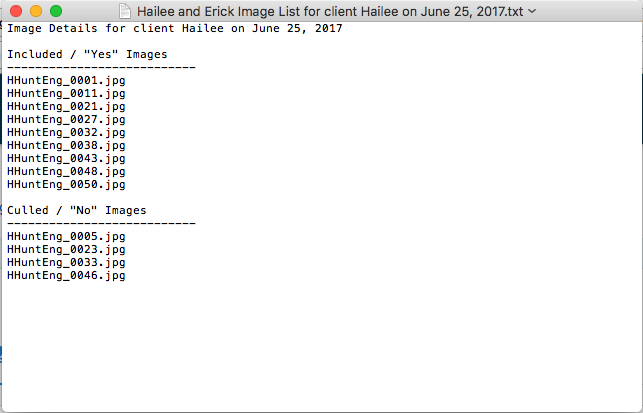 After your In-Person Sales meeting, you may find yourself wanting to see the list of images you marked as a "yes" image during the cull. Head into the client area for your client (Clients > Manage Clients > hover over the client thumbnail and click "Manage"). Navigate to the Images tab inside that client area. At the top right, you'll see a button that says "Download List"
That's it! Your list will download as a text file. Quick note: If you've done more than one In-Person Sales session for that client, you'll see a button for each session, as in the screenshot above. If you've only done one sales session for that client, you'll only see one button.